Amazon.com description: Product Description: The notion of information is multifaceted. According to the case, it is a simple signal or already knowledge. lt responds to codes and is inscribed into a social relationship. There are clearly many perspectives which the social sciences can take to analyse the notion of information. The economy cannot account for the majority of situations where, in the activities of production, consumption or exchange, the notion of information finds itself implied, although each school of thought has its own understanding of the notion of information. 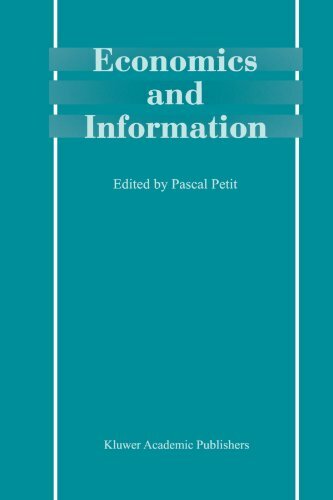 This book takes this observation as a starting point and goes on to clarify a contemporary debate on the economy of information which remains quite vague, making use of the ways in which different theoretical approaches deal with information. To seize the nature and scope of the transformations in our societies, a consequence of our new ways of handling, stocking and circulating information in the workings of the markets like Organisations, such a theoretical exercise seems useful. The organisation of the book results from this choice. The contributions gathered in one part deal with the role of information in the functioning of the markets, those featuring in another are more interested in the organisations. To favour an enriching cross-reading of approaches developed in the two sections already referred to, we have preceded these with a section gathering approaches (which are more transversal) developing different theories of information (according to perspectives which are, respectively, systematic, statistical or strategic). About: The notion of information is multifaceted.